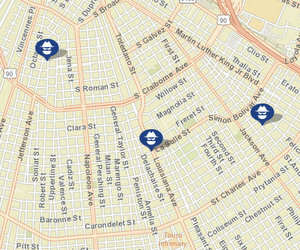 Four separate robberies were reported on Robert, Willow, St. Andrew and LaSalle streets on Saturday and Sunday nights, New Orleans police said Monday morning. Around 10 p.m. Saturday, Oct. 13, two men — one in his 40s, and one in his 50s — were walking in the 1900 block of St. Andrew Street (near O.C. Haley Boulevard) when a black, older-model vehicle approached, according to the initial NOPD report. Two men got out of the vehicle with guns and took their belongings, then got back into to the vehicle and drove off, the report states. About an hour later, a man in his 20s was walking in the 3400 block of LaSalle Street (near Louisiana Avenue) when a dark-colored sedan drove up, and two people got out, the report in that case states. They took the victim’s belongings at gunpoint and then drove off on Louisiana Avenue, the report states. The gunman in the LaSalle Street robbery was described as a black man with short-hair in his early 20s, wearing dark-colored pants and a “flag bandana” over his face, the report states. Around 7:30 p.m. Sunday, a woman in her 20s was getting into her vehicle in the 3500 block of Robert Street (near South Miro Street in Broadmoor) when three juveniles approached, and one with a gun pulled her back out of the vehicle, the report in that case states. The woman began screaming, and all three assailants ran off, the report states. The three juveniles were arrested shortly afterward by officers responding to a suspicious-person call of suspects meeting their description, the report states. One was arrested on South Rocheblave Street and the other two were on Fontainebleau, but their names were not released by police because of their ages. Further details were not immediately available in any of the above cases. Anyone with information that could assist investigators is urged to call CrimeStoppers at 822-1111 to leave an anonymous tip that could be eligible for a cash reward.